Many eyes will be focused on the ludicrous famous “ball drop” tonight in Times Square to mark the arrival of the new year in the eastern United States. Many TV cameras and uncounted phone cameras will be aimed southward toward a narrow building. Here is an earlier view of the exact same building, taken in 1908. That’s when the building served as the recently finished headquarters of the New York Times newspaper. 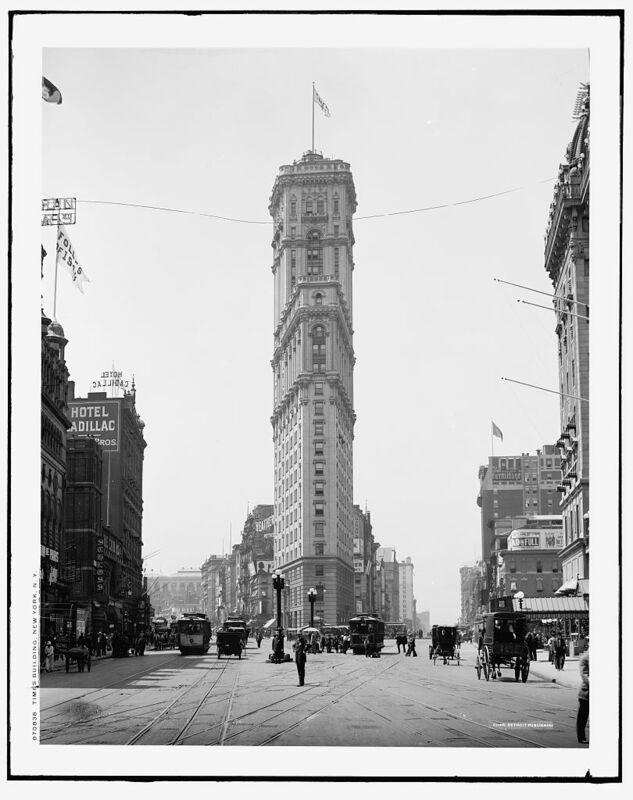 The paper’s owner, Adolph Ochs, was proud of the landmark building as a reflection of the Times‘ growing profits and prestige. He was so proud that he prevailed on the New York city government to rename the spacious intersection of Broadway and 7th Ave. from Longacre Square to Times Square. So, as the ball drops tonight, show this picture to your guests and raise a glass to Adolph Ochs.